Is Wild Side West Now San Francisco’s Last Lesbian Bar? Last week, the operators of the Lexington Club on 19th Street in The Mission announced that the bar will soon shut down. High rents and changing demographics were cited as the causes for the Lexington’s demise. Apparently @SFist is wrong about Lexington Club being the last lesbian bar in SF – Wild Side in Bernal Heights still exists – but still sad. 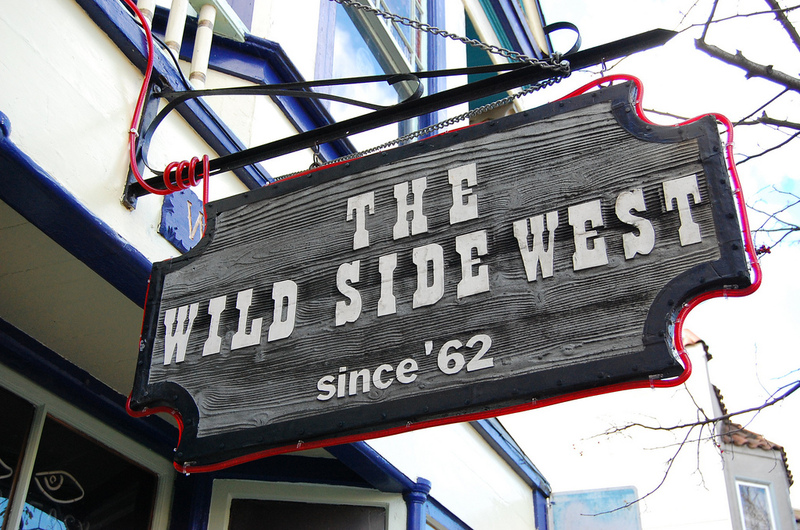 Some may argue the case for Wild Side West, which remains a LGBT-friendly neighborhood bar in Bernal Heights, open since 1962, with a historic link to the lesbian community, but anecdotally we understand it is more of a mixed bar these days. Bernalwood has considered this question of Wild Side West’s sexual credentials before, in the context of a larger discussion of the changing political economy of the Bay Area lesbian community. Yet with the closure of The Lex, the subcultural role of Wild Side West is now a bit more of an urgent question. Please discuss. Wild Side West is great. I am straight with a lot of gay friends and we love Wild Side West. All are welcome and Mr. Nancy makes the best martinis my friends have ever had. I never feel out of place and always have a great time. Why do we always have to put labels on places? Straight or gay if you get good drinks and good service who cares? When you live in a hetronormative world as a hetrosexual that’s an easy question to ask. When you are part of a minority group that is still persecuted in most places on Earth it is necessary to have “safe” places to congregate. That’s why gay/lesbian bars exist. Don’t forget, we still don’t have equal rights in this country and can only marry in 30 states (and that’s just in the last 5 years). The only place left in the city to find bearded ladies. Yes. Wild Side is a mixed bag and I love it that way. I’m not sure what specifically differentiates a lesbian bar from a mixed bar, but I can say my own personal opinion is that Wild Side West (WSW) is a mixed bar. My reasoning is as follows. I am a lesbian, but since I’m also a human, I surround myself with both straight and LGBTI friends. If I’m going to go to a bar with my lesbian friends, I’m going to go to the Lex. If I’m going to go to a bar with almost any other friend, straight women, gay men, whoever, I’d choose a different bar. That’s not because the Lex isn’t friendly, but because it is (in my mind) a space for lesbian women and F to M trans folks. It’s a safe and comfortable place for that community to congregate, and frankly that’s sacred to me. When it comes to WSW, I’d take anyone there without even thinking twice about it. I expect to see straight women and men in there, along with lesbians or trans folks, or whoever. This may be partially because WSW is in such a close knit Bernal neighborhood with only a hand full of bars to choose from, while the Mission is so expansive and diverse and has a million bars. Anyway, this is just my personal opinion and I’m sure others would disagree with me. Frankly, it’s sort of a non-issue now since the Lex is closing. Anyhow, there are still lotsa lesbians drinking there, bartending there, and playing pool there. If someone is lesbian, they’d go to Wild Side West or El Rio. They would be unlikely (or less likely) to go to Deluxe or Noc Noc. As lesbians assimilate and move elsewhere, it’s probably not a good idea to define one’s bar as a lesbian bar. Do lesbians need their own bar? What have they got against straight or other- type people, anyway? I have to agree with missionbernal: Byrd, you sound like you haven’t left your man cave in about 40 years. Sadly, this renders anything you have to say irrelevant, ignorant and ignoble. Reblogged this on The Cynthia Project.